When told that one of the kittens was a black-and-white like Gabby, I asked for that one but found someone had beaten me to it. Given my choice of two brown tabbies or a grey tabby with a white breast a few patches of almost apricot, I opted for the grey. When I took her to the vet next day, I was asked her name. I hadn’t picked one yet but, given her color and what had been playing on the radio that morning, I said “Misty,” and Misty she remained. Gabby was not pleased – I remember a night-time chase, a shattered full-length mirror, and me running after them threatening murder once I made sure they were both alright (they were). The two cats were never close, but hostility waned to armed truce and eventually mostly peaceful co-existence. Gabby ruled, but Misty’s imperious squeak had an authority of its own, leading to the nickname “Her Royal Squeakness.” When I passed her, she would often let out a distinctive and commanding “SQUEEAAK!” which meant she wanted me to sit down with my back at a slant so she could climb into my lap, place her front paws on my shoulder or neck, to knead and nuzzle lengthily – an activity accompanied by huge amounts of purring and that often left me with wet spots on blouse or sweater. I used to joke that what she was really saying was “Assume the position.” My brother found the whole thing rather disquieting. 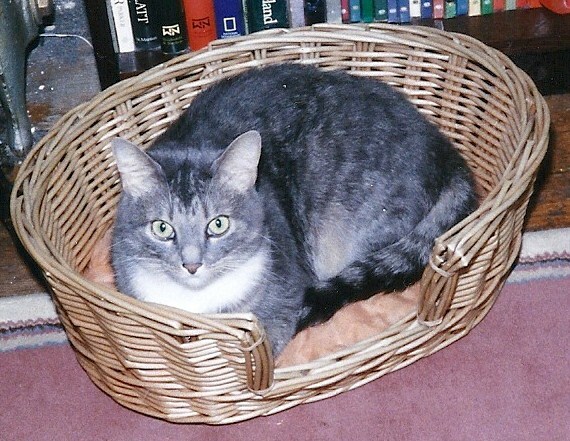 Misty was a quirky cat – the only one I’ve ever had with a sweet tooth. She used to love the buttery mini-danish from the local supermarket, and, having been told the story, the clerk there would always slip me a few in a bag when she saw me, whispering, “For the cat.” I once got a hand-made buttercrunch bar from a local ice cream parlor/confectionary and stuck it in the front pocket of my purse but was too tired to eat it that evening. When I got up the next day, I found the candy bar on the living room floor, unwrapped, the chocolate and nuts licked from one side, and the toffee part much diminished. Misty’s real passion, though, was corn muffins. I discovered this early on while making multiple batches of muffins to bring to church. I set out a batch of corn muffins to cool in the dining room and returned to the kitchen to bake a batch of whole wheat muffins. On returning with the new batch to cool, I discovered Misty hovering over the corn muffins, especially one in particular, whose top was now concave where once it had been convex. It became impossible to keep corn bread or muffins unless they were almost hermetically sealed. Misty would claw her way through plastic wrap, bags, or foil to get to anything baked with corn meal. 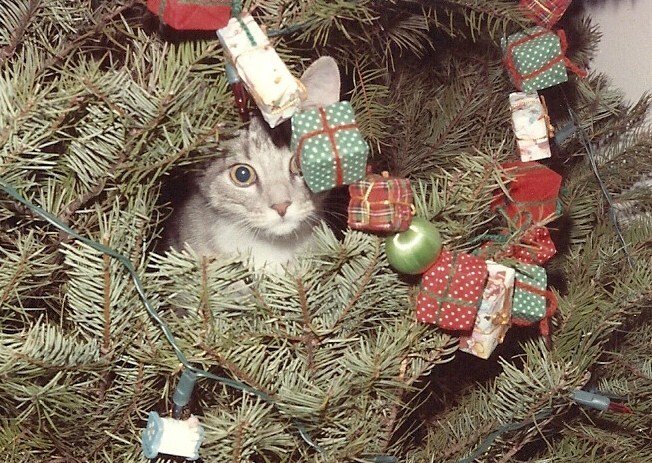 I brought Misty home in September at the age of seven weeks, so she was still quite young at Christmas that first year, and small enough to climb a five-foot Christmas tree while I was in the process of decorating it. 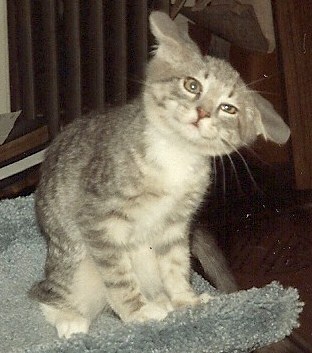 As all kittens are, she was adorable and silly and, although if I had known what the months immediately following her adoption would be like I might not have taken her, I never regretted it. The fall of that year my mother’s health troubles began: exhaustion leading to a leave of absence from work, tests, a pre-Christmas emergency bypass, recuperation, more tests, a spring heart attack, permanent disability. Through it all, Misty made us chuckle and, three years later when Mom was diagnosed with terminal cancer, Misty was a blessing to all of us those last six months, especially as Gabby died – at the good age of 16 – a few weeks after Mom’s diagnosis, and Mom’s own cat, Ashfurred, had to be put to sleep because of internal bleeding a month before Mom died. Mom was devastated by Ashfurred’s loss, and I brought Misty over to keep her company. As Mom became confined completely to bed in those last weeks, Misty became her constant companion, taking up residence on the foot of her bed. The last weekend of Mom’s life, Misty was there for all of us keeping the death watch and was with us when Mom died. She brought strength and comfort to all of us with her quiet love and devotion. « Adventures of an Intrepid Cat Caregiver or Is there a Feminine Form for “Nanook”? Oh. Thanks for the photos as well as the word pictures. What a wonderful cat. I wish I’d been able to meet Misty. what a fun post–so many meowmories! You tell a beautiful story. Thank you for giving us a vision of this lovely Misty. She was a lovely kitty — all my cats have been wonderful, even the difficult ones (I’m not convinced there is such a thing as a completely bad cat).